Inferno Metal Festival: THE INFERNO METAL FESTIVAL has become a true black Easter tradition for metal fans, bands and music industry from all over the world with around 40 concerts every year since the start back in 2001. The festival offers exclusive concerts in unique surroundings with some of the best extreme metal and experimental artists in the world, from new underground acts to the legendary giants. At INFERNO you meet up with fellow metalheads for four days of head banging, party, expos, horror films, art exhibitions and all the unholy treats your dark heart desires. 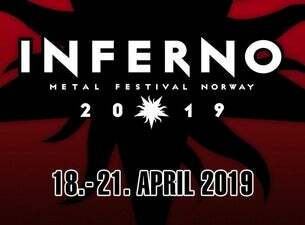 INFERNO METAL FESTIVAL invites you all to the annual black Easter gathering of metal, gore and extreme in Oslo, Norway from April 18th to April 21st 2019. Official Festival Hotel: Clarion Hotel The Hub. Book your room at festival prices and take part of the full festival experience. At the hotel you will have stands, DJ's, pre and after parties, our music conference, beer tastings and more.